ABSTRACT. The currently used classification reflects our understanding of the pathogenesis of the various forms of lupus nephritis, but clinicopathologic studies have revealed the need for improved categorization and terminology. Based on the 1982 classification published under the auspices of the World Health Organization (WHO) and subsequent clinicopathologic data, we propose that class I and II be used for purely mesangial involvement (I, mesangial immune deposits without mesangial hypercellularity; II, mesangial immune deposits with mesangial hypercellularity); class III for focal glomerulonephritis (involving <50% of total number of glomeruli) with subdivisions for active and sclerotic lesions; class IV for diffuse glomerulonephritis (involving ≥50% of total number of glomeruli) either with segmental (class IV-S) or global (class IV-G) involvement, and also with subdivisions for active and sclerotic lesions; class V for membranous lupus nephritis; and class VI for advanced sclerosing lesions]. Combinations of membranous and proliferative glomerulonephritis (i.e., class III and V or class IV and V) should be reported individually in the diagnostic line. The diagnosis should also include entries for any concomitant vascular or tubulointerstitial lesions. One of the main advantages of the current revised classification is that it provides a clear and unequivocal description of the various lesions and classes of lupus nephritis, allowing a better standardization and lending a basis for further clinicopathologic studies. We hope that this revision, which evolved under the auspices of the International Society of Nephrology and the Renal Pathology Society, will contribute to further advancement of the WHO classification. The morphologic changes in a renal biopsy from a patient with systemic lupus erythematosus (SLE) comprise a spectrum of vascular, glomerular, and tubulointerstitial lesions. The classification of SLE nephritis has evolved over the past 40 years as more lesions were identified and defined. It has been an increasing challenge to apply new pathogenetic insights to the interpretation of the renal biopsy in SLE and to correlate pathologic findings with clinical symptoms, choice of treatment, and prognosis. The current classification, which was advanced in 1982 (1) and revised in 1995 (2), reflects our understanding of the pathogenesis of the various forms of renal injury in SLE nephritis. However, subsequent clinicopathologic studies have revealed the need for clarification of the different categories and the diagnostic terminology. The classification of lupus nephritis is critical to the issue of patient care and for the comparison of outcome results and therapeutic trials between different clinics. It is imperative that pathologists reach a consensus concerning the definition of the different classes of SLE nephritis and the meaning of the pathologic terminology applied in order to standardize the way biopsies are interpreted and reported between different centers. With these objectives in mind, a group of renal pathologists, nephrologists, and rheumatologists convened to formulate a revised classification of lupus nephritis during a 3-day consensus conference held at Columbia University, New York, New York in May 2002. SLE is a multisystem autoimmune disease whose etiology and pathogenesis are incompletely understood. The development of autoimmunity in SLE has been attributed to a loss of self-tolerance due to inadequate central or peripheral deletion or silencing of autoreactive lymphocytes, leading to multiple autoantibody specificities (3). Dysregulated apoptosis and inadequate removal of apoptotic cells and nuclear remnants may contribute to autoimmunity by causing prolonged exposure of the immune system to nuclear and cell membrane components (4). The characteristic development of autoantibodies to DNA and other nuclear antigens, as well as to membrane phospholipids, support the relevance of both mechanisms (5,6⇓). In addition to established genetic predisposition, altered immunoregulatory factors or environmental stimuli may trigger autoimmune phenomena in certain populations. Recent studies have ascribed specific genetic linkages to the development of renal disease in SLE among certain ethnic groups, including European American and African American populations, some of which may determine the severity of the glomerular disease (7). Although knowledge of the etiology of SLE is incomplete, it is clear from the varied forms of tissue injury that a number of different effector mechanisms may act alone or in concert to produce the pleomorphic patterns of lupus nephritis. Autoantibodies may lead to cell and tissue injury by Fc receptor-mediated inflammation (8) as well as by direct cytotoxicity, which is usually complement-dependent, as has been shown for antibody-mediated hemolytic anemia or thrombocytopenia. In the kidney, intrinsic antigens such as extracellular matrix components or cell surface glycoproteins may serve as targets for autoantibody binding. In addition, renal injury in lupus nephritis may result from autoantibodies that bind to circulating antigens, forming circulating preformed immune complexes, or autoantibodies that bind to antigens deposited from the circulation in glomerular and vessel walls, causing in situ immune complex formation, as has been shown for nucleosomes and antidouble-stranded DNA autoantibodies (5). Subsequent Fc receptor and complement binding then initiates an inflammatory and cytotoxic reaction. Such cytotoxicity may be directed toward podocytes in the setting of membranous nephropathy, where in situ immune complex formation occurs along the subepithelial aspect of the glomerular basement membrane, or toward endocapillary cells in the case of the endocapillary proliferative and exudative inflammatory reaction that follows subendothelial immune complex formation. In addition to direct immune complex-mediated cell and tissue injury, autoantibodies with antiphospholipid or cryoglobulin activity may also promote thrombotic and inflammatory vascular lesions in SLE (9). Antineutrophil cytoplasmic-antigen autoantibodies (ANCA) have been described in a subgroup of patients with lupus nephritis and may initiate vasculitis and glomerulonephritis by “pauci-immune” neutrophil-dependent mechanisms similar to those described for microscopic polyangiitis or Wegener’s granulomatosis (10). Finally, it is also likely that other poorly characterized autoantibodies of unknown specificity (such as anti-endothelial antibodies) may be operant in the pathogenesis of some forms of lupus nephritis. Based on various experimental models of autoimmune and immune complex disease in the kidney and on observations in human renal biopsies, it is now well established that the glomerular patterns of immune complex-mediated injury are related to the site of accumulation of immunoglobulins, their antigen specificity, their capacity to bind and activate complement and other serine proteases, and their ability to evoke a cellular inflammatory response (11). These patterns of injury can be divided into three groups. In the mesangial pattern, mesangial hypercellularity and matrix accumulation result from mesangial immune complex accumulation, as can occur in IgA nephropathy or in mesangial proliferative lupus nephritis. In the endothelial pattern, an exudative component characterized by leukocyte accumulation, endothelial cell injury, and endocapillary proliferation. This pattern is often associated with capillary wall destruction, mild to marked immune complex deposition, and varying degrees of mesangial proliferation and crescent formation. This category is exemplified by severe postinfectious glomerulonephritis, antiglomerular basement membrane (GBM) disease, systemic vasculitis, and endocapillary proliferative forms of lupus glomerulonephritis, for example. Within the endothelial pattern of glomerular injury, a diffuse and global form can often be separated from a focal segmental form (as seen in microscopic polyangiitis), in which different pathogenetic mechanisms may prevail. The endothelial pattern of injury can also be caused by nonimmunologic mechanisms, such as shear-stress in malignant hypertension, bacterial toxins in verocytotoxin-induced thrombotic microangiopathy, and thrombotic events in SLE-associated lupus anticoagulant syndrome. Persistent accumulation of immune complexes in the subendothelial space may lead to more severe injury and chronic changes, including cellular interposition and replication of the GBM. These endocapillary changes usually occur in association with mesangial pathology because the mesangium is in direct continuity with the subendothelial space and is accessible to circulating immune complexes. This combined mesangiocapillary or membranoproliferative pattern of injury is particularly common in the chronic phase of lupus nephritis. In the epithelial pattern, antibodies and complement inflict cytotoxic injury on the podocyte resulting in a nonexudative, nonproliferative capillary wall lesion, as can be seen in idiopathic and SLE-associated forms of membranous glomerulopathy. The usual clinical manifestations of these three major morphologic patterns can be predicted based on the topography and character of the glomerular lesions. Mesangial pathology leads to a syndrome of microscopic hematuria and subnephrotic proteinuria with well-preserved or minimally reduced glomerular filtration rate (GFR); the endocapillary pattern is characterized by an acute reduction in GFR, hematuria, and mild to moderate proteinuria; and the membranous pattern is associated with significant proteinuria, often with nephrotic syndrome, and with preservation or gradual reduction in GFR. These three patterns of injury, which encompass the spectrum of most glomerular diseases regardless of etiology, also apply to the major subtypes of glomerular involvement in SLE. In lupus glomerulonephritis, as in other glomerular diseases, it is not uncommon for several different morphologic patterns to coexist, leading to a more complex clinical expression of disease. The introduction of renal biopsy in the 1950s, the application of immunofluorescence and electron microscopic techniques in the 1960s, and increasing knowledge about mechanisms of immune-mediated glomerular injury derived from experimental studies on serum sickness and other models formed the basis of the recognition and classification of the various patterns of renal injury in SLE. As early as 1964, focal segmental glomerulitis, diffuse proliferative glomerulonephritis, and membranous glomerulopathy were recognized as separate entities (12,13⇓), followed by the identification of mesangial lesions in the 1970s (14). The first World Health Organization (WHO) classification was formulated by Pirani and Pollak in Buffalo, New York in 1974 and was first used in publications in 1975 (15) and 1978 (16) (Table 1). This classification addressed glomerular lesions only. Class I was applied to renal biopsies showing no detectable glomerular abnormalities by light, fluorescence, or electron microscopy. Class II was defined as purely mesangial immune deposition and was subdivided into two subclasses depending on whether mesangial hypercellularity was present. Class III lesions were defined as proliferative glomerulonephritis affecting fewer than 50% of the glomeruli (i.e., focal), whereas class IV was defined as proliferative glomerulonephritis affecting more than 50% of the glomeruli (i.e., diffuse). No qualitative differences between class III and class IV lesions were described. Membranous lupus nephritis was classified as class V. Tubulointerstitial and vascular lesions were not included in the classification system. In 1982, the WHO classification was modified by the International Study of Kidney Diseases in Children (1) (Table 2). Class I was applied to normocellular glomeruli and was now divided into two subclasses based on whether mesangial immune deposits were identified. Class II was applied to purely mesangial proliferative glomerulonephritis and was divided into two subcategories based on the severity of the mesangial hypercellularity. Class III now denoted focal segmental glomerulonephritis with necrotizing lesions and class IV was used for diffuse glomerulonephritis, without stipulating criteria for the percentage of affected glomeruli. Within class IV, there were subdivisions of variants with severe mesangial proliferation, membranoproliferative features, or extensive subendothelial immune deposits in the absence of endocapillary proliferation. In addition, the 1982 classification introduced subdivisions for class III and IV based on the presence of active, chronic, or mixed types of glomerular injury. Class V denoted membranous glomerulonephritis but was subdivided based on the presence of mesangial hypercellularity and overlaps with focal proliferative (class III) and diffuse proliferative (class IV) lupus nephritis. Class VI was introduced to denote advanced sclerosing glomerulonephritis, although the percentage of glomeruli requiring sclerosis was not stipulated. The use of numerous subcategories and the handling of mixed classes made this modified classification cumbersome for some pathologists to use and impeded effective communication with the clinicians. These drawbacks prompted many pathologists to continue to work with the older 1974 WHO classification. The concept of active and chronic renal lesions was first introduced by Pirani, Pollak, and Schwartz (17) and subsequently refined by Morel-Maroger et al (18). Austin et al (19) devised a system of applying semiquantitative scores for activity and chronicity by grading and adding the individual morphologic components in a given biopsy as a guide to treatment and prognosis. Activity and chronicity scores are used as an adjunct to the WHO classification of lupus nephritis by many practicing pathologists, although the reproducibility and the predictability of these indices have been questioned by some (20). In 1995, attention was again drawn to the significance of segmental glomerular capillary wall necrosis (2), a lesion also characteristic of glomerular injury in systemic vasculitis. Some investigators consider segmental glomerular necrosis to be the defining feature of class III lesions, regardless of the percentage of glomeruli involved. Subsequent studies by Najafi et al (21) revealed the poor outcome of diffuse segmental necrotizing glomerulonephritis involving over 50% of glomeruli, (which these investigators consider a severe form of class III), as compared to other forms of class IV lupus nephritis. In order to accommodate the clinicopathologic and pathogenetic insights that have accumulated since the 1982 and 1995 modifications of the original 1974 WHO classification and to eliminate inconsistencies and ambiguities, we propose a new revised classification (Tables 3 and 4⇓). This revised classification preserves the simplicity of the original WHO classification, incorporates selective refinements concerning activity and chronicity from the 1982 and 1995 revisions, and adds a number of new modifications. Overall, it bears a strong similarity to the 1974 classification, but introduces several important modifications concerning quantitative and qualitative differences between class III and IV lesions. The major objective is to standardize definitions, emphasize clinically relevant lesions, and encourage uniform and reproducible reporting between centers. Like the preceding classifications, this new classification is based exclusively on glomerular pathology. We strongly recommend that any significant vascular and tubulointerstitial pathology be reported as separate entries in the diagnostic line. As a premise, we emphasize that adequacy of the tissue specimen and histopathologic techniques are mandatory for a reliable classification. For accurate pathologic analysis, it is important that the tissue should be optimally preserved, processed by a skilled technician, cut at 3 microns, and sectioned at multiple levels. Proper tissue handling and use of special stains are essential for accurate and complete assessment of glomerular number, cellularity, and capillary wall alterations. In order to reasonably exclude a focal lesion, the biopsy should contain a minimum of 10 glomeruli for light microscopic analysis (22). Immunofluorescence is required for complete renal biopsy analysis and should include staining for IgG, IgA, and IgM isotypes, kappa and lambda light chains, and complement components C3 and C1q. Glomerular immune deposits attributable to lupus nephritis as detected by immunofluorescence almost always contain dominant polyclonal IgG, as well as C3 and in most instances C1q, with variable codeposits of IgA and IgM. If glomerular immunoglobulin deposits are restricted to IgA or IgM, diagnostic possibilities other than lupus nephritis should be considered in correlation with serologic and clinical findings. While the role of electron microscopy in the diagnosis and classification of lupus glomerulonephritis cannot be underestimated and may be essential in some cases (23), the lack of readily available electron microscopy facilities in many centers throughout the world should not prevent the skilled pathologist from rendering a diagnosis of lupus nephritis using a combination of complete light microscopic and immunofluorescence studies. We recommend appropriate fixation and storage of a sample of renal cortical tissue for ultrastructural evaluation when needed. Definitions for diagnostic terms are given in Table 5. Class I is defined as minimal mesangial lupus nephritis with mesangial accumulation of immune complexes identified by immunofluorescence, or by immunofluorescence and electron microscopy, without concomitant light microscopic alterations. A complete lack of renal abnormalities by light microscopy, immunofluorescence, and electron microscopy no longer qualifies as class I, and in this respect is a change from the 1974 WHO classification. Class II is defined as mesangial proliferative lupus nephritis (Figure 1) characterized by any degree of mesangial hypercellularity (defined as three or more mesangial cells per mesangial area in a 3 micron thick section) in association with mesangial immune deposits. By immunofluorescence or electron microscopy, there may be rare isolated small immune deposits involving the peripheral capillary walls in some examples of class II. However, the identification of any subendothelial deposits by light microscopy would warrant a designation of class III or class IV depending on the extent and distribution of the subendothelial deposits. Similarly, the presence of any global or segmental glomerular scars that are interpreted as the sequela of previous glomerular endocapillary proliferation, necrosis or crescents is incompatible with class II and would be consistent with either class III or class IV depending on the number of scarred glomeruli. Figures 1–6. (1) Lupus nephritis class II. Light micrograph of a glomerulus with mild mesangial hypercellularity [periodic acid-Schiff (PAS)]. (2) Lupus nephritis class III (A). Light micrograph showing a glomerulus with segmental endocapillary hypercellularity, mesangial hypercellularity, capillary wall thickening, and early segmental capillary necrosis (methenamine silver). (3) Lupus nephritis class III (A). Light micrograph showing a glomerulus with segmental capillary necrosis with sparing of the remainder of the capillary tuft—a vasculitis-like lesion (methenamine silver). (4) Lupus nephritis class IV-G (A). Light micrograph showing a glomerulus with global involvement of endocapillary and mesangial hypercellularity and matrix expansion, influx of leukocytes, and occasional double contours (methenamine silver). (5) Lupus nephritis class IV-S (A). Segment of a glomerulus showing endocapillary hypercellularity, capillary wall double contours, wireloop lesions, and hyaline thrombi (PAS). (6) Lupus nephritis class IV-G (A/C). Light micrograph of a glomerulus showing global severe endo- and extracapillary proliferation, wireloop lesions, leukocyte influx, apoptotic bodies, capillary necrosis, and mesangial expansion with hypercellularity and matrix expansion; marked interstitial inflammatory infiltration (PAS). Class III is defined as focal lupus nephritis involving less than 50% of all glomeruli. 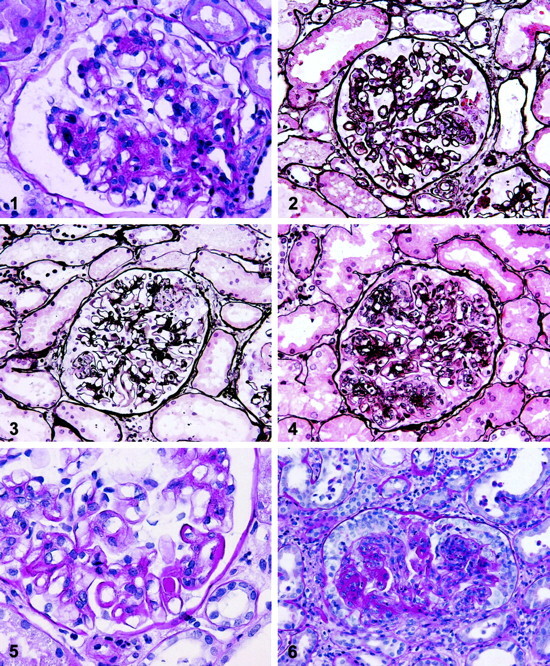 Affected glomeruli usually display segmental endocapillary proliferative lesions (Figure 2) or inactive glomerular scars, with or without capillary wall necrosis and crescents, with subendothelial deposits (usually in a segmental distribution). In assessing the extent of the lesions, glomeruli with both active and sclerotic lesions will be taken into account. Focal or diffuse mesangial alterations (including mesangial proliferation or mesangial immune deposits) may accompany the focal glomerular lesions. In a pilot study of pathologists from seven different centers on 50 consecutive cases of lupus glomerulonephritis, for a total of 350 specimens, class III lesions were found to be almost invariably segmental and rarely global. Vasculitis-like lesions characterized by segmental capillary necrosis in the absence of endocapillary proliferation were rare (Figure 3). Figures 7-12. (7) Lupus nephritis class IV-G (A/C). Glomerulus with global endocapillary proliferation, leukocyte influx and apoptotic bodies, double contours, crescent formation with tubular transformation, early sclerosis, and disruption of Bowman’s capsule (PASd). (8) Lupus nephritis class IV-G (A). Glomerulus with widespread subendothelial immune deposits (wireloop lesions) associated with basement membrane new formation along the inner side of the capillaries but without endocapillary leukocyte infiltration or hypercellularity (methenamine silver). (9) Lupus nephritis class V. Glomerulus with advanced-stage lupus membranous nephropathy characterized by massive subepithelial accumulation of immune deposits (immunofluorescence: full house) and interdigitating spike formation (methenamine silver). (10) Lupus nephritis class IV and V (A/C). Glomerulus with lupus membranous nephropathy with subepithelial spike formation combined with global endocapillary and mesangial hypercellularity, early crescent formation, and beginning mesangial and capillary sclerosis (methenamine silver). (11) Lupus nephritis class VI. Renal cortex showing almost diffuse, global glomerular sclerosis accompanied by interstitial fibrosis, mononuclear inflammatory infiltrates, and vascular sclerosis (methenamine silver). (12) Thrombotic microangiopathy in a patient with SLE and circulating anticoagulans. A glomerulus showing severe capillary and arteriolar thrombosis, endothelial cell swelling and necrosis, neutrophil influx, and stasis of erythrocytes. No signs of immune deposits (methenamine silver). In the body of the report, parameters of activity and chronicity (Table 6) should be described. In the diagnostic line, the proportion of glomeruli affected by active and chronic lesions and by fibrinoid necrosis and crescents should be indicated. In addition, the presence of any tubulointerstitial or vascular pathology should be reported in the diagnostic line. This new schema should facilitate correlation of the proportion of glomeruli affected by active, necrotizing and chronic lesions and clinical outcome. A specific diagnosis of combined class III and class V requires membranous involvement of at least 50% of the glomerular capillary surface area of at least 50% of glomeruli by light microscopy or immunofluorescence. Class IV is defined as diffuse lupus nephritis involving 50% or more of glomeruli in the biopsy. In the affected glomeruli, the lesions as described below may be segmental, defined as sparing at least half of the glomerular tuft, or global, defined as involving more than half of the glomerular tuft. This class is subdivided into diffuse segmental lupus nephritis (class IV-S) when >50% of the involved glomeruli have segmental lesions, and diffuse global lupus nephritis (class IV-G) when >50% of the involved glomeruli have global lesions (Figure 4). Class IV-S typically shows segmental endocapillary proliferation encroaching upon capillary lumina with or without necrosis (Figure 5), and may be superimposed upon similarly distributed glomerular scars. Class IV-G is characterized by diffuse and global endocapillary, extracapillary, or mesangiocapillary proliferation or widespread wireloops. Any active lesion may be seen with class IV-G, including karyorrhexis, capillary loop necrosis, and crescent formation (Figures 6 and 7⇑). Rare examples of extensive (diffuse and global) subendothelial glomerular deposits with little or no proliferation (Figure 8) should also be included in this category. The new subdivision for segmental and global lesions is based on evidence suggesting that diffuse segmental lupus nephritis may have a different outcome than diffuse global lupus nephritis. In the pilot study of seven different centers mentioned above, 35% of 135 class IV biopsies revealed a predominantly segmental distribution of lesions, as opposed to 65% that showed a predominantly global distribution. The study further showed that fibrinoid necrosis is usually associated with endocapillary hypercellularity and may therefore be a more severe expression of the same pathogenetic mechanism. In the report, parameters of activity and chronicity (Table 6) should be described. In the diagnostic line, the proportion of glomeruli affected by active and chronic lesions and by fibrinoid necrosis or crescents should be indicated. In addition, the presence of any tubulointerstitial or vascular pathology should be reported in the diagnostic line. It is recognized that scattered subepithelial deposits are commonly seen in class IV biopsies. Therefore, a diagnosis of combined class IV and class V is warranted only if subepithelial deposits involve at least 50% of the glomerular capillary surface area in at least 50% of glomeruli by light microscopy or immunofluorescence microscopy. In assessing the extent of the lesions, both active and sclerotic lesions will be taken into account. By way of illustration, a renal biopsy containing a total of 20 glomeruli, of which there are segmental active proliferative lesions in four and segmental inactive scarred lesions in ten should be designated class IV-S lupus nephritis. Class V is defined as membranous lupus nephritis (Figure 9) with global or segmental continuous granular subepithelial immune deposits, often with concomitant mesangial immune deposits. Any degree of mesangial hypercellularity may occur in class V. Scattered subendothelial immune deposits may be identified by immunofluorescence or electron microscopy. If present by light microscopy, subendothelial deposits warrant a combined diagnosis of lupus nephritis class III and V, or class IV and V, depending on their distribution. When a diffusely distributed membranous lesion (involving >50% of the tuft of >50% of the glomeruli by light microscopy or immunofluorescence) is associated with an active lesion of class III or IV (Figure 10), both diagnoses are to be reported in the diagnostic line. As class V evolves to chronicity, there is typically the development of segmental or global glomerulosclerosis, without the superimposition of proliferative lupus nephritis. However, if the glomerular scars are judged to be the sequela of previous proliferative, necrotizing or crescentic glomerular lesions, then a combined designation of class III and class V lupus nephritis, or class IV and class V lupus nephritis should be applied, depending on the distribution of the glomerular scarring. Class VI (advanced-stage lupus nephritis) designates those biopsies with ≥90% global glomerulosclerosis (Figure 11) and in which there is clinical or pathologic evidence that the sclerosis is attributable to lupus nephritis. There should be no evidence of ongoing active glomerular disease. Class VI may represent the advanced stage of chronic class III, class IV, or class V lupus nephritis. Without the aid of sequential renal biopsies, it may be impossible to determine from which class the sclerotic glomerular lesions evolved. The Consensus Conference in New York found that accurate reporting of the renal biopsy findings in a detailed and organized manner is an essential requirement to facilitate clear communication with the clinician. A detailed description (quantitative and qualitative) of all the findings by light microscopy, electron microscopy, and immunofluorescence should be followed by a diagnostic segment summarizing and including the class of lupus nephritis (sometimes more than one class), percentage of glomeruli with severe active lesions (fibrinoid necrosis, crescents), and of glomeruli with other active and chronic lesions. The extent, severity, and type of tubulointerstitial (tubular atrophy, interstitial inflammation, and fibrosis) and vascular disease (Figure 12) (vascular deposits, thrombi, vasculitis, sclerosis) should also be documented and graded (mild, moderate, severe) in the diagnostic line. Table 5 lists the standard definitions that should be applied to renal biopsy interpretation in lupus nephritis.Table 6 summarizes a number of markers for activity and chronicity of lupus nephritis that we propose should be included in the report. Tubulointerstitial and vascular markers of activity and chronicity can also be applied. Activity and chronicity can be scored semiquantitatively using the system formulated by Austin et al (19) or as agreed upon in individual medical centers according to institutional preference. Similar guidelines should apply to the reporting of repeat renal biopsies in an individual patient. In such cases, a comparison with the previous biopsy should be made and important changes in class, activity, and chronicity should be highlighted. Finally, it is important to realize that the renal biopsy findings, per se, cannot be used to establish a diagnosis of SLE. The renal biopsy findings must be interpreted by the referring clinician in the context of the patient’s entire clinical presentation, including serologic findings. The authors would like to thank Dr. J. Churg, Dr. R. McCluskey, Dr. C. Pirani, and Dr. V. Pollak for their positive comments, and Dr. T. Nadasdy for critical review of the manuscript. The Lupus Nephritis Consensus Meeting at Columbia University, College of Physicians and Surgeons was supported financially by The International Society of Nephrology, The Renal Pathology Society, The S.L.E. Foundation, Inc., The Mary Kirkland Center for Lupus Research, and The Kidney and Urology Foundation of America. Because of the importance of this paper, it is being published simultaneously in Kidney International. Twenty-two years' experience with childhood-onset SLE in a developing country: are outcomes similar to developed countries? Nephrotic Syndrome after Hematopoietic Cell Transplantation: Do Glomerular Lesions Represent Renal Graft-versus-Host Disease? More Targeted Treatments for Lupus Nephritis: Is the Future (Nearly) Here?